The Marshall Philharmonic Orchestra will close its 56th Season THIS SUNDAY with a heartfelt nod to the future. 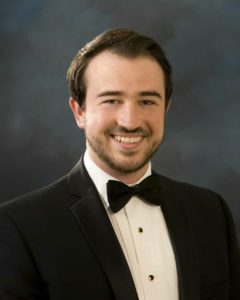 The concert will feature Marshall High School’s Choral Activities Instructor and Marshall Community Chorus Assistant Director, Ryan Layton, as bass-baritone vocal soloist, and will further enlist the talents of the Marshall High School Orchestra. The concert will begin at 2:30 p.m. in the Harold L. Lickey Auditorium of Bueker Middle School and is generously underwritten by Wood & Huston Bank. Ryan, a Marshall High School graduate, will perform works by Mendelssohn, Rodgers and Hammerstein, and Gilbert and Sullivan at Sunday’s event.